My sister, Elizabeth Rose Horton, died yesterday at age 53 of cancer. She was five years younger than me, blonde, energetic and fun, smart and practical. She leaves behind a son with a personality a lot like hers but cranked a few notches higher, and a gentle and loving husband. Through hard work, Beth created a good life and a happy home in west Texas. But she smoked, and last January she was diagnosed with small cell lung cancer, an especially aggressive kind. It seemed to be in remission when I saw her at Fourth of July, but it came back. I spent a few weeks with her in November and December to help her and her husband, and to get her to a Thanksgiving family reunion at my younger brother’s home. Though we were far away in distance, we were close by telephone and internet. In person or by phone, we would talk — and laugh and laugh. Even at the end, when she was weak and often confused, she was still making jokes. My little sister was the glue that kept people together, and now we must do it ourselves. She was maid of honor at my wedding in 1992. This is a photo of us with my grandmother and mother. 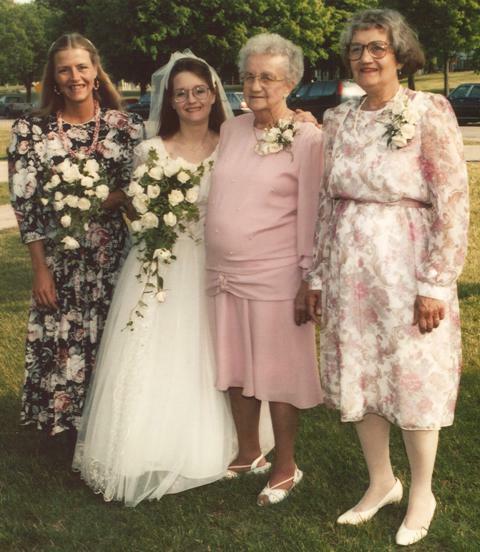 My mother died in 1994, my grandmother in 2001, and my sister in 2014. I'm sorry to hear this. My condolences. Thank you. People have been very kind, and that helps. I am so sorry for your loss. There are no words really; please know I'm thinking of you. Thank you. Your kind thoughts -- everyone's kindness -- is a real help. So sorry for your loss, old friend. Thank you. That annoying little sister of our joint childhood became a wonderful friend in adulthood. I miss her already. May the memories be a blessing and a comfort. My sympathy to you and yours. I remember when she got her first car, and our grandfather convinced her (briefly) that one thing she had to do to winterize it was to change the air in the tires from summer air to winter air. We all laughed about that. So very sorry to hear this. Sounds like you've got some good memories, and while that doesn't make this "better," it will give you some small comfort, maybe. Thank you. I remember when she was getting married, and my job the day before the wedding was to keep her calm. At one point she had two cigarettes going at once and never noticed -- until I pointed it out years later, and we had a good laugh. Thank you for the hug. Thank you. The support of friends has been a real help. Thank you for your kind thoughts and prayers. They are very much appreciated. Thank you. It has been hard and I am comforted by the sympathy and support of so many people. Thank you. Her final days were in the loving care of her son and husband, and home hospice nurses "who couldn't be sweeter," she said. I spoke to her one last time on Monday, and although she was very weak and confused, I told her I loved her -- and I even made her laugh.